the Jonathan Pollard spy case. not accept the offer to sit on it. ty and prepares for summer opening. President. Cynnie List presides over Women's Division. cent go on to higher education. cy was at an all time high. "I could see quite a change. named in their honor in Hod Hasharon, Israel in 1985. If you receive a call I January 22nd April 1st I. PLEASE STA Y ON THE PHONE! Telephone number, will be .elected randomly by computer, therefore. .11 call* will be anonymous. Demographic Siud\ Committee Chair: Startle* B. Brenner v.v." onv^S;S.^Sr fcJL^X J ting the highest communal ; for 1987-88 are being presented. Dr. Chanover will hold a M M Vice President.................................Marcia Shapiro !j! Parent Involvement in Early p^-inpnt Fmpritiis nf th <>me btart series wnicn nas :;; (14) daya prior to the May 31t Annual Meeting provided ? witn tms mnovative educator, subscription series for parents Associate, at the Federation Pmcourt-Maaon. IH urging he act immediately. country that will accept him. system on someone else s."
does not respond to the letter. and thus denied far too long,"
said Rep. Bill Green (R-N.Y.). lied about his Estonian past. ed to review the case. the primary beneficiaries don't survive you. or the amount paid for the policy. have always made this claim. tion. Country Reports on Human Rights Practices fir 1986.
force and the intelligence services." "brutality and forcible repression to insure its survival." permitted.. .Women do not enjoy equality with men." : gradual evolution of the Parliament..."
:j: tian converts from Islam." There remains one Middle Eastern oasis of human rights. :: of all issues of popular concern." POSTMASTER: Send .ddr.c ctwngts to Tha Jewish Floridian. Combined Jawiah Appeal Jewish Federation ol Palm fteach County, Inc.. Otllcara: Praatdant. wnar.iky; Traaaurar. Barry S. Barg. Sacratary, Haian G Hoffman. Submit malarial to Nonnl Epstein. Director ol Public Retationa. 501 Sooth Flagler Dr.. Waal Palm Baach. FL 33401. 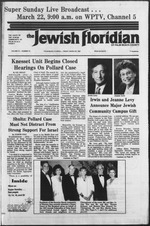 Jewish Floridian doaa not guarantee Kaahruth ol Merchandise Advertlead. second largest Air Force base. broadcast from the Airport Hilton. Jewish Education Committee 7:30 p.m. Bat Gurion 9:30 a.m. Hadassah Aliya 1 p.m.
Na'Amat USA Council President's workshop 9:30 a.m.
Federation Mid-East Task Force noon. great strides due to Mrs.
Chairman of the Nominating Committee. Hank Grossman, and Elizabeth Shulman. ment, at the Federation office, 832-2120.
ews in Israel and worldwide. Libya "opened a new chapter"
clear stand taken by Qaddafi"
and Mr. and Mrs. Herman Hirshberg. Mr. and Mrs. Cy Nathan, Mr. and Mrs. Morris Lubov, and Mr. and Mrs. Leo Kaye. (Seated) Mr. and Mrs. Bert Hornstein and Mrs. Robert Levin. (Standing) Mr.
nard Sillins; Mr. Alan Swotes; Mrs. Jane S.
County; and Dr. and Mrs. Joseph Zeger. analyst employed by the U.S.
to a discussion entitled "Is There a Battle of the Sexes?" a.m. Donation: $1 plus own fare. drink specials and complimentary buffet. Donation: $1. non-members $5. To RSVP and for directions, call Rachel. together. Meet at the bandshell at Bryant Park (Lake Ave.
Inn (3550 So. Ocean Blvd.) for drinks and a bite to eat. the drink specials and complimentary buffet. Donation: $1. to all Pisces and Aries. Donation: $1 plus your own fare. socialize and make long range plans for Spring events. places to see and bring your ideas to this special meeting. Donation: JCC members $1; non-members $1.25. sent the very talented and special Asolo Touring Theatre. the JCC at 700 Spencer Dr., West Palm Beach. Fee: $6. tion on bringing Passover into your home. movement, Suzuki violin, cheerleading and drama. 689-7700. Fee: JCC members $35; non-members $45. Mondays 6:30-8 p.m. at the JCC. Instructor: Deri Ronis. and ongoing opportunities to socialize. Please register now. side trips will incur separate fees. Thursdays 7-8:30 p.m. at the JCC. Instructor: Deri Ronis. vacation periods and courses they wish to take. No Fee. Ours; Yoga; and, Positive Choices. ACTIVITIES INFORMAL /Breakfast. Lunch and Din. Vender Walde of Congregation Anshei Shalom. aspects of the relative's lives. given to their resident kin. Palm Beach 33417. Phone 686-5055. Sabbath services 8:46 a.m.
and sundown. Daily services 8:15 am. and 5:45 p.m.
Saturday morning 10:30 am. Phone 878-7476. P.O. Box 2113, Vero Beach, FL 82961-2113. Rabbi Richard D.
ple, 100 from each country. | board, and touring expenses. T, w E 76" Wert **n Beach. ^iM^ March 20 6:14 p.m.
various areas of the country. but our paste's no joke. thank goodness for Chef Boyardee. per package. 1967 Cadbury Schweppes Inc.
on its agenda," he said. and more than 50,000 in 1979.
ing until the year 2000,"
ings us to 6,000 a year. ding) Sam Jungreis and Alec Jacobson. Nat and Ida Mae Allweiss. to remind Aides of the tunes. gadahs? How much do I read? Who prepares the seder plate? relatives to the Seder feast. Puritan* Oil is a heakhydioiee. 1985 and in Bern in 1981. This event is for Hadassah Life Members and Associates. North A Street, Lake Worth. mond Jubilee. Refreshments will be served. date of their "Las Vegas Fling" to May 4-7. Temple Beth Sholom, 315 "A" Street, Lake Worth. ment will be provided by Joe Rene, singer and racounteur. teaching, research and child care projects in Israel. monthly Study Group at 10 a.m. on Thursday, April 2.
and much more. One price covers all. will be a "mini seder." Jewish music. A mini-lunch will be served. Shalom, 315 No. "A" Street, Lake Worth. ly Shay and her Music Makers." now acted in this spirit." behalf of our ally Israel." integrity of the United States. has been the Pollard case. think it is an outrage." help for his illegal act. peBng. Water Skang. AeroUce. Tom*. Danoe. Qo Carts. Tripe. Roaar-Skakng. mm Inch Haas 306 US MM *r Writ. challenges imposed by a modern mobile society. and start new lives in the Negev. Eastern Europe, Ethiopia and the Moslem world. distress who seek new lives in free lands. "One People with One Destiny"
and agencies in the Palm Beaches.